Despite several delayed votes over the past several months, and amid a flurry of controversy, the Inter-American Development Bank (IDB) recently voted to grant a loan to finance Perus $1.6 billion Camisea Gas and Pipeline Project, less than two weeks after the Export-Import Bank (Ex-Im) of the United States rejected financing the project entirely. 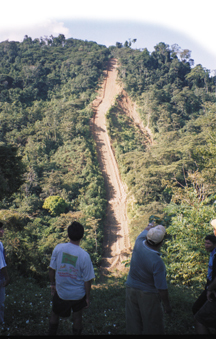 The Camisea pipeline now runs through the Shimaa community in the Upper Urubamba River Valley in Peru. Machiguenga people watched the construction in June. Photo courtesy of Amazon Alliance. Camisea is Perus largest development project and represents almost one point of gross domestic product per year for the next 30 years of the project, according to Perus ambassador to the United States. The IDBs characterization report says that the Camisea project could significantly raise the national standard of living, lower the cost of energy and reduce air pollution. But environmental and human rights organizations are up in arms over the threat to the ecosystem and peoples of the Amazon. The Camisea reserve is 10 times larger than any other existing natural gas reserve in Peru, and holds around 13 trillion cubic feet of gas, with more than 480 million barrels of associated natural gas liquids (propane, butane and condensate). The project would link a collection of fields by pipelines, providing natural gas and natural gas liquids for domestic consumption and for export, according to two major companies sponsoring the project, Argentinean-based Pluspetrol and American-based Hunt Oil. Much of the concern about the project surrounds placement of the two pipelines that will carry gas and the liquids out of the Camisea region. The gas pipeline runs 714 kilometers from the Camisea field to Lima on the coast, while the liquids pipeline runs 540 kilometers to a port south of Lima. Those routes take the pipelines through sensitive areas in the tropical Amazon rainforest, including an indigenous peoples reserve, where most of the inhabitants choose to live in isolation. Also, the present site of the proposed port and a liquid natural gas plant is located in the buffer zone of Perus only marine sanctuary for endangered birds and mammals. Pluspetrol and Hunt Oil applied for around $300 million in loans and loan guarantees from the two public banks to finish the project, which is already 70 percent complete. But many international groups were lobbying the banks, as well as the U.S. Congress, to halt the development, or at least to delay the funding until more complete environmental reviews and assessments could be completed. Several members of Congress joined in the fight, suggesting that the Bush administration consider environmental impacts further before giving the go-ahead. The United States owns the largest percent of shares in the 46-country IDB and the Department of Treasury directs U.S. voting on the board of executive directors. Despite, or perhaps because of, a U.S. abstention, on Sept. 10, the 14-member international board voted 13-0-1 in favor of loaning $135 million for the pipeline transportation component of the project. The Ex-Im board of directors rejected the loan request on Aug. 28 by a vote of 2-1, citing environmental considerations, including potential damage to Perus rainforests and indigenous peoples. The IDB loans are conditional on Peru carrying out mitigation measures to reduce the construction and operation impacts on the environment and the populations living in the region, says Daniel Drosdoff, a spokesman for IDB. Still, environmentalists worry that too much damage has already been done and that the project does not meet U.S. or international standards for environmental protections. In mid-August, Pentex Oil UK announced the most significant onshore discovery of oil in the United Kingdom in 20 years. The company found the field on farmland at Avington, near Winchester in Hampshire in the south of England. Initial evaluation suggests the field contains the equivalent of more than 100 million barrels of oil. The company carried out preliminary exploration tests after procuring a license from the Department of Trade and Industry. It hopes to produce oil commercially by the end of the year if further tests are positive and oil recovery proves financially viable. Generally, any onshore field in Europe or North America with more than 1 million barrels of oil will prove financially viable. If this field is as large as initial indications suggest, it will be a useful addition to Britains reserves, though still not a major find on a global scale. For instance, while it is larger than any oil field in the Denver basin in the United States, the field is dwarfed by the 2 billion-barrel Brent field in the United Kingdom sector of the North Sea. The price of Brent crude oil is a global standard and often quoted during times of oil price instability. Perhaps the most significant aspect of this find is that it demonstrates the potential of finding appreciable amounts of oil in areas that many have dismissed as having little or no remaining potential, says Peter McCabe, a research geologist with the U.S. Geological Survey (USGS). Most of the big oil discoveries we hear about these days tend to be offshore, but a substantial majority of the oil that has been found is onshore, McCabe says. In fact, the most recent USGS estimate of undiscovered oil reserves in the world suggests that fully 50 percent of the oil remaining to be discovered is onshore. Pentex produces the equivalent of 2,500 barrels of oil a day from four onshore wells at Stockbridge and 60 wells at Gainsborough in the East Midlands, and it is the United Kingdoms third largest onshore supplier of oil. According to BBC News, the farmer who owns the land will only receive a small fee  he isnt about to become the next J.R. Ewing, he told the news agency. U.S. Geological Survey Perlite Commodity Specialist Wallace Bolen has prepared the following information on perlite  a recently discovered but commonly used mineral. Perlite is found in most homes, workplaces and schools. Most of the white ceiling tiles in offices and classrooms are made primarily of perlite. The soil around potted plants also has small white grains of perlite. Other than in these lightweight construction products and horticultural soil mixes, perlite is used in food processing for filtration and in natural gas processing as a low-temperature insulation that aids the gas liquefaction process. Perlite is also an excellent high temperature insulator and resists burning. Perlite is one of the newest economically significant minerals. Controlled experiments using perlite from near Superior, Ariz., did not occur until 1940, and perlite was not used extensively until 1945. What is unique to perlite and just a few other minerals, such as vermiculite, is that when perlite is heated, its volume increases and its density decreases dramatically  a characteristic discovered only in 1928. Dropping a sample of sand-sized particles of crude processed perlite into a large furnace at 760 to 1,100 degrees Celsius causes the perlite to pop like popcorn, expanding to as much as 20 times its original volume. The average density of so-called expanded perlite is about 110 kilograms per cubic meter, whereas the average density of crude processed perlite is about 2,300 kilograms per cubic meter. A large bag of expanded perlite at a local home improvement store is as light as a large bag of popcorn. The largest perlite mines are in New Mexico, with others in Arizona, California, Idaho, Nevada, Oregon and Utah. After mining, crude perlite is crushed, sorted into several sizes and then shipped throughout the United States. This crude processed perlite goes to expanding plants, which heat treat the mineral and then either use or sell it. Armstrong World Industries in Lancaster, Pa., is by far the largest producer and consumer of expanded perlite, making many of the ceiling tiles used in the United States. Mining companies in the United States sold or used about 500,000 metric tons of crude processed perlite, with an average value of about $36 per ton, in 2002. Imports of crude processed perlite, about 175,000 tons per year, supply about 25 percent of the demand in the United States. In 2002, 63 perlite expansion plants sold or used about 670,000 tons with an average value of $217 per ton. Estimates put the United States as the largest producer and consumer of crude processed and expanded perlite in 2002. Other leading producers of crude processed perlite were, in descending order, Greece, Japan, Hungary and Turkey. Visit the USGS minerals Web site for more on perlite.